::: The Ant and The Contact Lens ::: – Mentor My Way Inc.
Well, she got to a ledge where she could take a breather. As she was resting there, the safety rope snapped against Brenda’s eye and knocked out her contact lens. There she was, on a rock ledge, with hundreds of feet below her and hundreds of feet above her. Of course, she looked and looked and looked, hoping her contact lens had landed on the ledge, but it was just not there. Here she was, far from home, her sight was now blurry. Brenda was desperate and began to get upset. She prayed to the Lord to help her to find it. When she got to the top, a friend examined her eye and her clothing for the lens, but there was no contact lens to be found. Despondent, she sat down with some of the party waiting for them to make it up the face of the cliff. She looked out across the range of mountains and thought of the verse that said: “For the eyes of the Lord run to and fro throughout the whole earth …” She thought “Lord, you can see these mountains. You know every stone and leaf and you know exactly where my contact lens is. Please help me. Finally, she walked down the trail to the bottom. A new party of climbers was just starting up the face of the cliff. One of them shouted out: “Hey guys! Anybody lose a contact lens?” Well, that would be startling enough, but do you know where the climber saw it? An ant was moving slowly across the face of the rock, carrying it on his back. The story gets better. Brenda’s father is a cartoonist. 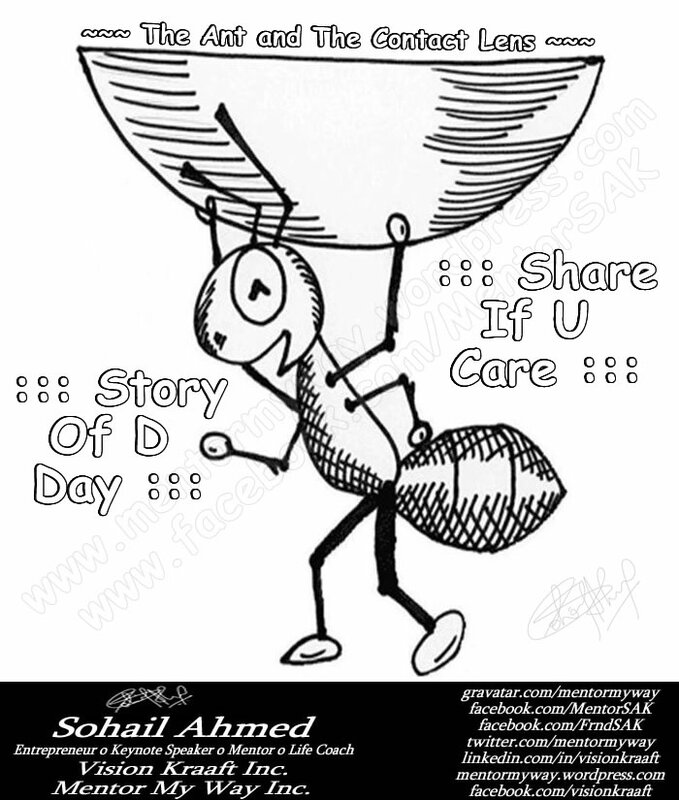 When she told him the incredible story of the ant, her prayer and the contact lens, he drew a picture of an ant lugging that contact lens with the words: “Lord, I don’t know why you want me to carry this thing. I can’t eat it, and it’s awfully heavy. But if that’s what you want me to do; I’ll carry it for you. I can appreciate the story of rock climbing, facing adversity and the part about the contact lens and the ant. But to associate the ant with having a hard time carrying the contact lens is silly since anyone with a 5th grade education in science knows that ants can carry weights many many hundreds of times of their own body weight. Despite the inaccuracy it’s a good story to always keep your head up and have faith in the people around us and in how amazing mother nature can be. Thnaks John….. Do Help Us In Spreading the Word About Our Motivational Blog.